On June 11, 2018, Attorney General Jeff Sessions issued a disheartening decision to erode protections for domestic violence survivors and individuals fleeing pervasive gang violence — people who look to the United States for refuge. Invoking a rarely utilized power, Sessions reversed asylum for a Salvadoran domestic violence survivor in a case known as Matter of A-B-. Ms. A.B. fled to the United States after suffering 15 years of brutal violence at the hands of her ex-husband. He beat and kicked her, including while she was pregnant, bashed her head against a wall, threatened her with death while holding a knife to her throat and while brandishing a gun, and threatened to hang her. Ms. A.B. attempted to secure protection from the government and police to no avail. Unfortunately, the case of Ms. A.B. is all too common. Gender-based violence is one of the major reasons that women and girls seek asylum. This may be due to gender-discriminatory laws in their home country or culturally accepted forms of violence against women such as domestic abuse, female genital mutilation or honor killings. Northern California has one of the largest populations of refugee-immigrants from Central America, which has among the highest rates of femicide in the world. Every year, EBSC provides direct legal assistance to more than 325 women fleeing domestic violence. Most live in the East Bay. If women are deported back to their home country, they are at risk of being killed by their abuser. Because survivors suffer from post-traumatic stress disorder, major depression and/or other psychological problems, EBSC partners with other Bay Area organizations to provide counseling and support for highly traumatized clients. With legal and social support, asylees are able to rebuild their lives and raise their children in safety in the United States. EBSC offers English instruction, citizenship classes and access to education. Some of our asylum clients have gone on to study at UC Berkeley and other schools, pursuing their dreams and opportunities. 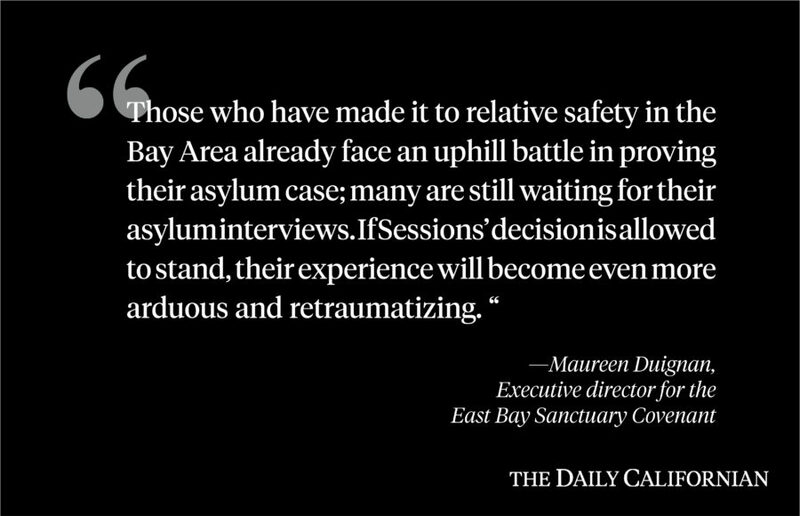 Those who have made it to relative safety in the Bay Area already face an uphill battle in proving their asylum case; many are still waiting for their asylum interviews. If Sessions’ decision is allowed to stand, their experience will become even more arduous and retraumatizing. Thousands of Bay Area residents — including survivors, their children and other family members — will be impacted. Sessions’ decision in Matter of A-B- is a malicious attempt by the Trump administration to overrule long-standing precedent regarding how private violence can be part of a viable asylum claim; his decision reflects the significant anti-immigrant and misogynistic attitudes of this administration. However, it is important to note that this decision does not mean that claims based on persecution by nonstate actors, including domestic violence, are no longer viable. Under U.S. and international law, our country is obligated to provide refuge to people like Ms. A.B. who suffer persecution and are unable to avail themselves of protection in their home countries. We join the Center for Gender & Refugee Studies, or CGRS, and others to call on Sessions to reverse this tragic decision. We urge everyone to take action to support safety for people fleeing violence and persecution. Volunteer! EBSC has a very close relationship with UC Berkeley students and staff: [email protected]. We can’t stand idly by while women’s lives are at stake. Sister Maureen Duignan is the executive director for the East Bay Sanctuary Covenant. EBSC and CGRS staff contributed to this op-ed.